Got a chance to play with our new friend Brian’s phone, he can do live video conferencing with the phones, (this means two people can carry on a video and audio conversations even on remote areas of the country) the screens easily flip around for easy viewing. 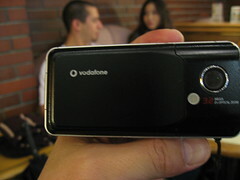 It’s got a 3.2 megapixel camera onboard, MP3 player, and internet and email access. The display is a very large and vibrant LCD screen, most of the phones have onboard external speakers so it’s easy to hear those speaking without ear buds. I don’t see too many folks with bluetooth earbuds here in Japan. While larger than my phone, he’s got the advantage of convergence while I’ve got to lug around three devices to do what he can easily do: iPod, Camera, and Cell phone.